Onboarding is the process of helping your company’s new hires adjust to the social and performance aspects of their jobs as quickly as possible. Human Resources and training staff are highly involved in the beginning stages, with job function mentors and direct managers more involved in the later phases. Did you know that 22% of companies have no formal onboarding process? If you want to retain your employees beyond the first year and have those employees performing at their best, you need to build a strategic onboarding process flow. Properly introducing your new employees to your company culture, their responsibilities, and their coworkers not only helps employees feel more welcome—it also helps your bottom line. "Telling employees the expectations, delivering impeccable training and support to meet those expectations and then create opportunities for easy but meaningful wins in the first few months." Organizations with a standard onboarding process experience 50% greater new hire productivity and are 69% more likely to retain their employees up to three years. And with the cost of replacing an employee falling between 16% and 20% of that employee’s salary, holding on to those well-trained employees longer is better for you and your company. Download Lucidchart’s onboarding process template below. Compliance: Teaching new hires the basic rules, regulations, and policies that define your company. Clarification: Educating new hires on their job functions and performance expectations. Culture: Advising new hires on formal and informal organizational norms, such as the company dress code. Connection: Helping new hires to build interpersonal and interdepartmental relationships in your organization. Why a strategic onboarding process flow? Bringing new employees into an existing company structure can be difficult. That’s why we recommend that you build a strategic onboarding process, with clearly defined roles for Human Resources, mentors, managers, and new hires. When you document your onboarding process flow beforehand, your organization will be able to increase each new hire’s ability to contribute in their role quickly, increase their comfort level, and reinforce their decision to join your organization, leading to higher retention and better long-term performance for both the employee and the company. There are two common approaches for building an onboarding process flow—by its five major stages and by its timeline. Read on below to learn about both in detail and see which is right for you and your organization. The first major approach divides the onboarding process into stages, beginning before the new employee’s start date with the preparation stage. The process moves subsequently through orientation, integration, and engagement, and ends with reviewing the process in the follow-up stage. Usually, Human Resources and training staff are highly involved in the beginning stages, with job function mentors and direct managers more involved in the later phases. Generally, the preparation stage spans from the pre-arrival stage through about the first month or so of the new hire’s employment. This phase of the employee onboarding process includes pre-start paperwork, a formal introduction to the company’s policies and procedures, and an informal introduction to company culture through the employee’s environment. The integration phase of the new hire onboarding process doesn’t have a set time frame, but it generally goes on for the first six to 12 months of the employee’s journey with your organization. This phase has the employee slowly building up their work through mentorship from other employees with similar job functions. The engagement phase also lasts through the first year or so of the employee’s time on the job. This phase is all about personal relationships within the employee’s team, their manager and/or direct reports, and members of cross-functional teams. For example, our People Ops team at Lucid sets up “new hire lunches” so new employees have the chance to meet people from different teams. True engagement makes the new employee feel welcome and comfortable with the company culture. The follow-up stage of the onboarding process for new employees is where you should evaluate the employee’s performance and integration into the team. Some companies do this at 90 days, some at six months, some at a year, some at all those milestones. Human Resources or the new hire’s manager meets with the employee to discuss if they are hitting specific performance metrics and also to evaluate how the employee “fits.” This phase also allows your organization to measure the efficacy of the onboarding program itself. The other oft-used onboarding process flow is based on a timeline, beginning before the employee’s start date—right after the employee is hired—and continuing through the first year of employment. The onboarding process flow includes tasks related to the new hire’s schedule and job duties, socialization, training, development, and work environment, performed by Human Resources, training staff, mentors, hiring managers, and the employees themselves. Building an onboarding process checklist helps you get things done. Download Lucidchart’s onboarding timeline template below. Once the employee is hired, confirm the start date with the new hire and begin preparation for their arrival. During this phase, it’s important to provide any information the employee needs for their first day, such as required identification or paperwork they can fill out ahead of time and the office’s dress code. Human Resources prepares for the employee’s arrival by getting paperwork for benefits and payroll ready, training staff readies for new hire orientation and job function training, and managers prepare for the employee’s first assignments. If necessary, get IT involved to set up the new hire’s workstation. On the employee’s first day, greet them and bring them into the orientation room, where they’ll fill out any necessary paperwork. It’s important to get the employee set up at their workstation, instruct them on any programs they’ll need to communicate, let them know of their schedule for the first week, and invite them to any required meetings. Introduce the employee to their coworkers—a lunch gathering is the perfect place to do this in a relaxed, social setting. If applicable, give the employee their first assignment and get them working. Throughout the employee’s first week, assist them in getting to meetings at the right time and place and give them small assignments that are achievable and measurable to get them up to speed. Mentors and/or managers should stick close to the employee to make sure they feel welcome and comfortable in their new role. Throughout the first month, continue to work with the employee to integrate, giving them larger and larger assignments and introducing them to more co-workers across the company. Schedule regular one-on-one meetings to evaluate their performance and make sure they feel comfortable. Human resources should check in to make sure payroll and benefits are properly activated. At the three-month point, it’s a good idea to check in and review the employee’s performance and to gauge their feelings about their work environment. Continue to introduce the employee to the company’s different aspects, even outside of their job function, and involve them in corporate social events, both formal and informal, to expose them to more of the company culture. Managers and/or mentors should collaborate with the new hire on a six-month performance review to evaluate not only the employee’s job function but also the success of the onboarding process for new employees. At this point, the employee should be fully integrated into the team’s workflow and the company culture. Parts of the onboarding process throughout the rest of the first year build upon the foundation of what has come before. As the employee gets more acclimated, they should be encouraged to participate more in company committees and cross-functional teams and to contribute to the company culture. The end of an employee’s first year is a perfect time for performance evaluation—and if you see your employee performing well both individually and as a member of the larger team, you will know that your onboarding process has been a success. 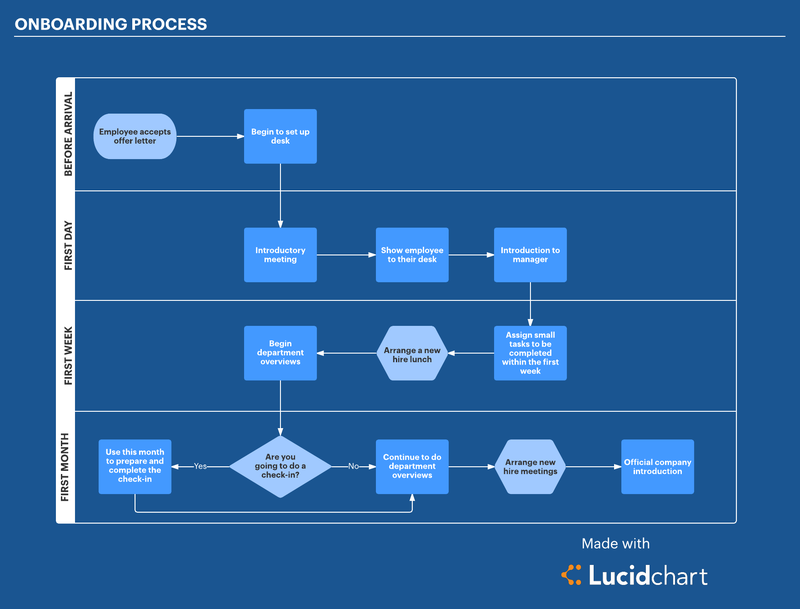 Whichever method you choose to build your onboarding process workflow—by phase, timeline, or a combination of the two—you can create flowcharts and process maps using Lucidchart to better illustrate the onboarding process. No matter how many people are involved in your onboarding process, you can diagram each person’s role, responsibilities, and accountabilities easily and clearly. Because Lucidchart exists in the cloud, it’s simple to share an always up-to-date onboarding process right in Lucidchart or store it through one of our many integrations. Ready to map out your onboarding process?